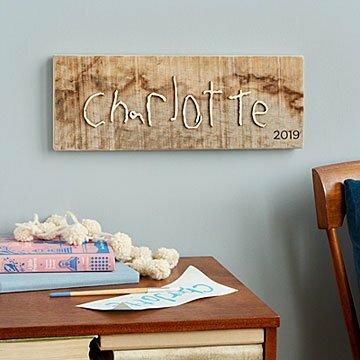 This sweet barnwood sign brings their unique signature off the page and onto the wall where it belongs. If you think your kid is cute (um, duh), better get it in writing. This sweet barnwood sign brings their unmistakable signature off the page and onto the wall where it belongs. Melyssa, Michele, and Christine Kirn take your image or scan of the signature and create a laser-cut version out of birch, adding three-dimensional texture. Then they laser engrave the year into the corner. Give one to the parent or grandparent who loves to name drop their little one. Handmade in Kentucky. Keep inside in a dry environment. Do not set products on top of item for storage.